One of my favorite of the American Weekly cover cartoonists is Fish (Anne Harriet Sefton), so I've already covered two of her series, Awful Week-ends and The Diary of a Lady's Maid. 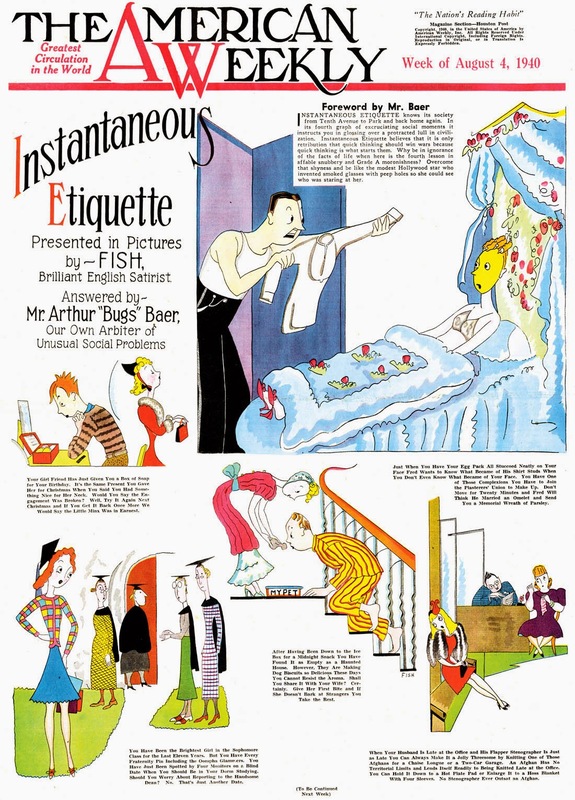 Here's a third, called Instantaneous Etiquette. This one's unusual in that she teamed up with a writer, Arthur "Bugs" Baer. This is a great match, except that the two were on opposite sides of the Atlantic. Well, obviously they overcame that obstacle somehow. The delightful series, which lampoons newspaper advice columns, was so good that American Weekly featured it in three separate series, each around 2-3 months in length. First series started July 21 1940 and ran at least through August, then in 1941 an uncertain start date and ending August 8, and the third from October 11 to December 13 1942.